Iron Maiden was right at the beginning of heavy metal. There is no denying their influence for every metal band from the 80’s on. They were very influential on Slayer, whose early works sound very similar to Iron Maiden licks. Even Now that metal is coming back bands like Mastodon who are taking the next steps of metal that maiden help start. In their own right there are a second level icon behind bands like Zeppelin and Sabbath who are the godfathers of rock music. My favorite album of Iron Maiden is Power Slave. It is the heaviest of all the Maiden albums. It features some of their best songs including Power Slave, Rhyme of the Ancient Mariner, and 2 Minutes to Midnight. I would also recommend the album Killers which was released before Bruce Dickinson was their singer. The songs Murders in the Rue Morgue and Killers exhibit more of a hard rock feel quite a bit more similar to ACDC in their early work than the later more melodic. They were known for putting out concept albums which the whole collection of their albums follows the story of their giant mascot Eddie. 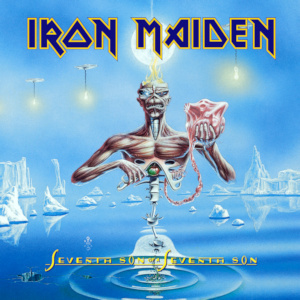 Iron Maiden includes Steve Harris (bass), Bruce Dickinson (singer), Janick Gers (guitar), and Nicko McBrain (drums). Their albums include 1979 Soundhouse Tapes Rockhard, Iron Maiden , Killers , The Number of the Beast , Piece of Mind , Powerslave, Somewhere in Time Sony, Seventh Son of a Seventh Son , Trooper , Stranger in a Strange Land , Running Free Run to the Hills , No Prayer for the Dying , Fear of the Dark, The X Factor , Virtual XI , Brave New World and Dance of Death.